In keeping up with our effort to give back this month, we’ve highlighted the ins and outs on Giving Back to Your Community and How to Give Back While on the Road. Today we have a special interview with the ever inspiring duo, Kayla and Eric, the creators of the budding brand, Winks & Whiskers. 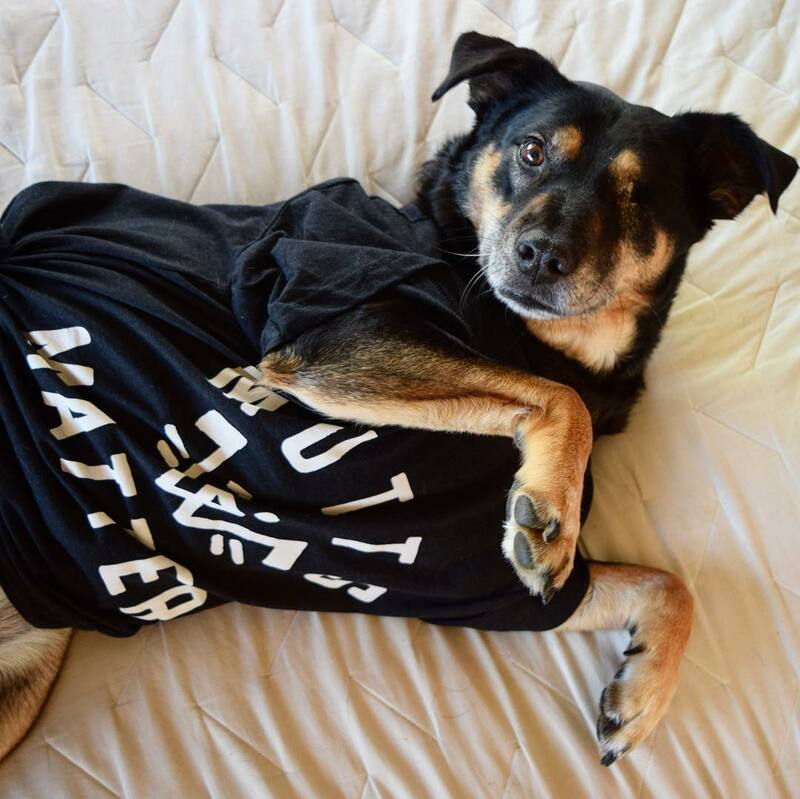 After adopting their one-eyed beauty, the couple set out to give back to those like Sadie, animals who need a home and support, by creating the cutest graphic t’s, tanks and accessories you’ve ever seen. Check out the full interview below to learn their story, how they live and work on the road full-time, their design process and which charities they donate to. Tell us your story! When and why did you start Winks and Whiskers? W&W: Five years ago we were newlyweds in the next phase of our relationship, which we decided, was to adopt a dog. We went to our local shelter where Eric was looking for a spry younger pup he could go running with but I was hesitant as I knew the responsibility of caring for an animal was no little thing. Neither of us had grown up with dogs, so adopting a pet was a new experience for both of us. As soon as I saw Sadie, I knew we were meant to be hers. She was five years old, missing her left eye and had been at the shelter for awhile. We adopted Sadie and she became our whole world. I went into full “Dog Mom” mode toting the three of us to pet friendly patios around the city and all the dog events I could find. 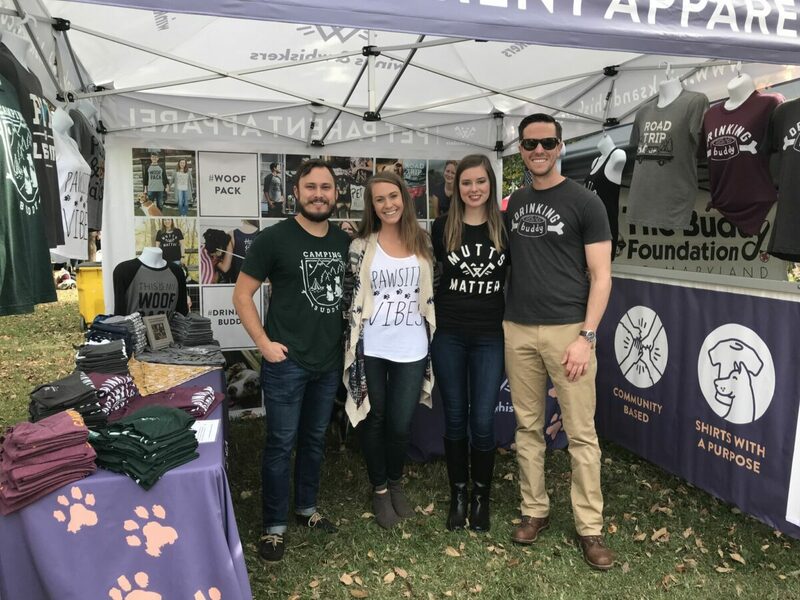 Going to these events, like 5k for K9’s or Dog Fest, we noticed there weren’t many options for great quality designed t-shirts for pet parents. That was the seed that started the idea for an apparel brand that gives back to animals in need. Winks and Whiskers is a tribute to our pup Sadie. Her wink is apparent with her missing left eye and she has endless whiskers on her face. We’ve been in business for a little over two years and have donated over $6,000 to our spotlight charities. W&W: Giving back to us means giving all “Sadie’s” the second chance they deserve to find unconditional love from a forever family. Tell us about the charities you work with. How do you choose which ones to spotlight? W&W: Winks and Whiskers spotlights one charity for two months. A 60 day spotlight gives us the opportunity to donate a sizable amount to each charity. We like to feature no-kill, foster based charities, which typically rely on volunteers and donations to save animals from euthanasia and/or the horrific situations they are in. 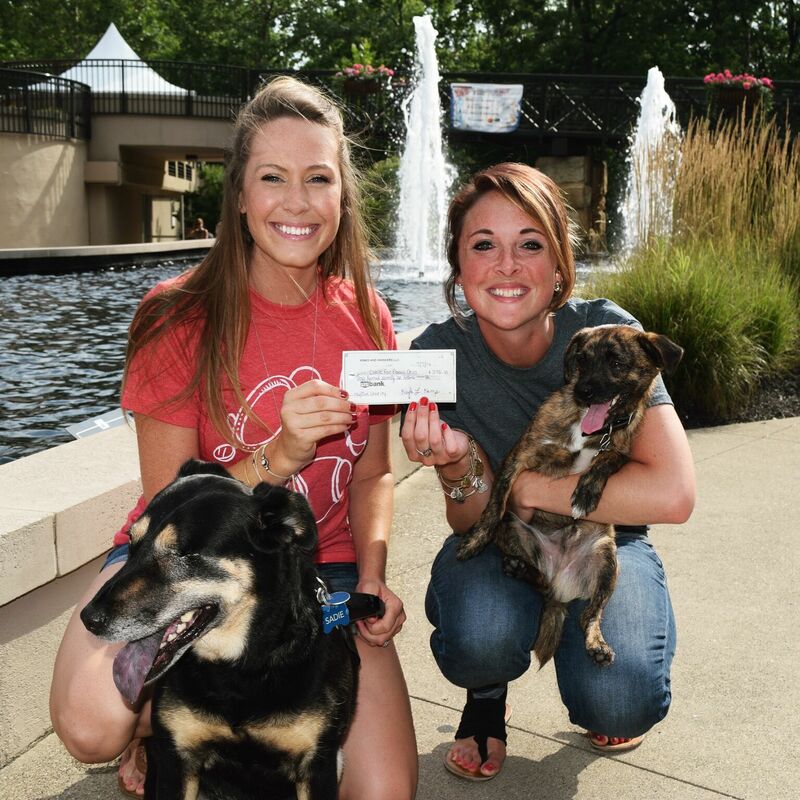 A few of the amazing charities we’ve been able to give back to since we started are Cause for Canines, Angels of Rawley Foundation, and Veteran Companion Animal Services. When choosing a charity, they always seem to find us at the right moment. One example of this is when we found a dog along side the road while traveling in California. We had exhausted all options to help re-home this furry one and didn’t know what to do next when Angels of Rawley Foundation contacted us about working together. Crazy enough, they just so happened to be in the same city we were in so they helped foster the pup until he was adopted two weeks later. We made them our spotlight charity for the next two months. To learn more about the work we do, check out our Spotlight Charity page. 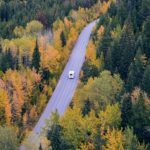 What drew you to living out of an RV? How many years have you been on the road? W&W: We lived in a downtown apartment, worked the 9 to 5 grind, had a dog walker take Sadie out in the middle of the day and only saw each other after work for a few hours before we went to bed and did it all over again. We both have the same passion for wanderlust and spending time together as a family. We were ready for something new and decided to launch our business while living on the road full-time for the next eight months. It took a lot of planning and hospitality from our friends and family as we launched Winks and Whiskers in May 2016 and started traveling in July of that same year. 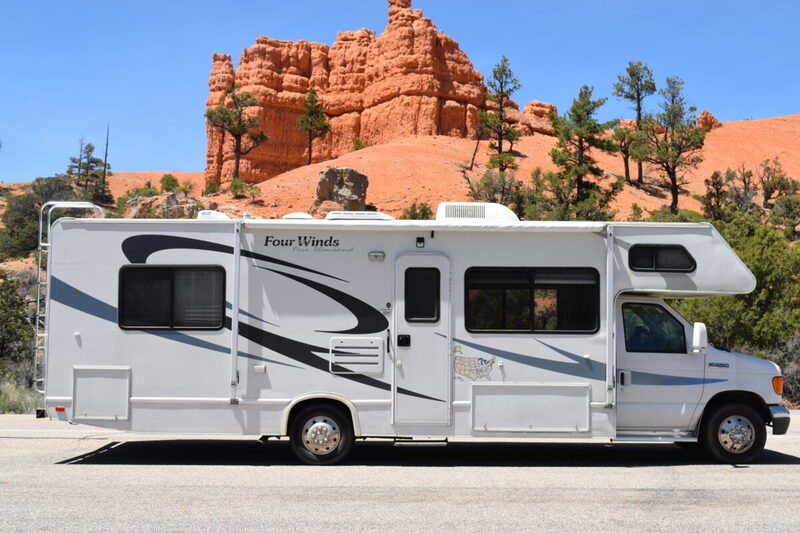 Originally the plan was to buy a travel trailer, (we had already bought the truck and were ready to purchase) but much like when I saw Sadie, I saw this RV and knew immediately it was meant for us. Living in our RV has given us the opportunity to travel all over America with Sadie sitting on one of our laps in the passenger seat. Traveling has given Winks and Whiskers tons of exposure and afforded us the opportunity to attend events in over a dozen states. The three of us have been traveling full-time for two years and do not plan to stop anytime soon. 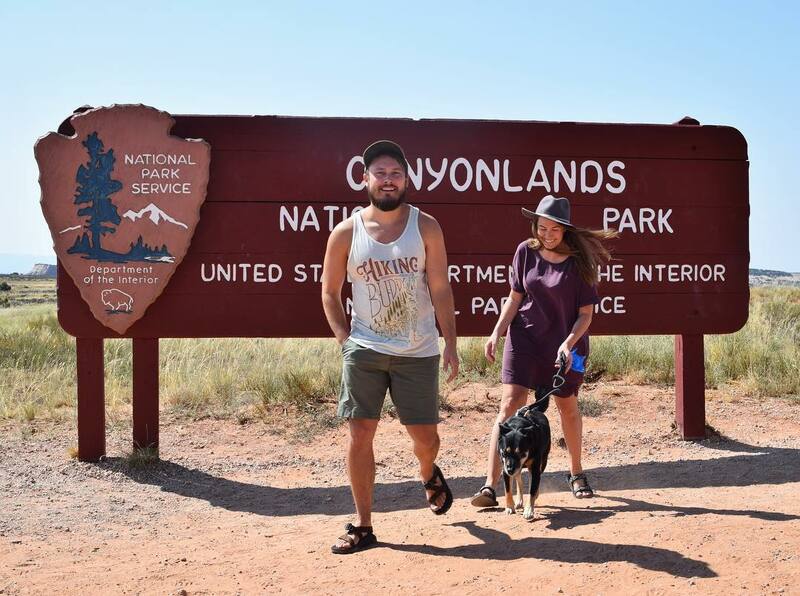 We share our travels on Instagram Camping with the Kemps, if you want to follow along! W&W: She is a true Dogdom (I got her DNA test done.) The shelter said she was a Rottie mix which I thought was true because of her coloring. Eric and I were both shocked after getting her results back to see all the breeds that make up our Sadie. She is Miniature Pinscher, Beagle, German Shepherd and Chow Chow. Her coloring actually comes from the Min Pin and she has floppy ears like the Beagle and a furry tail like the German Shepherd and a black tongue like the Chow Chow. What makes Winks and Whiskers different from other apparel companies? W&W: We are a family business run from our tiny home on wheels. 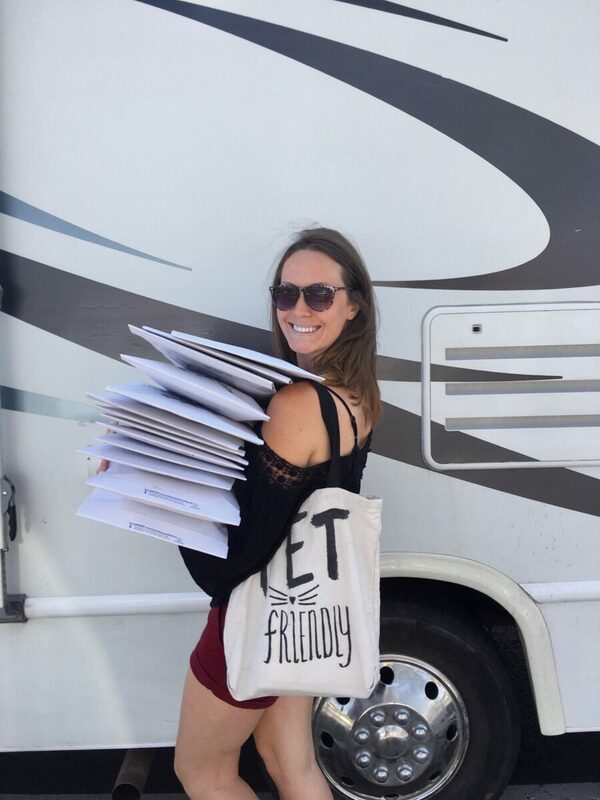 When we get an order, we pull over to fill the package with the customers tees (and of course positive vibes), then drop it off at the nearest post office! Who designs your T-Shirts? The slogans are so clever! We love them. 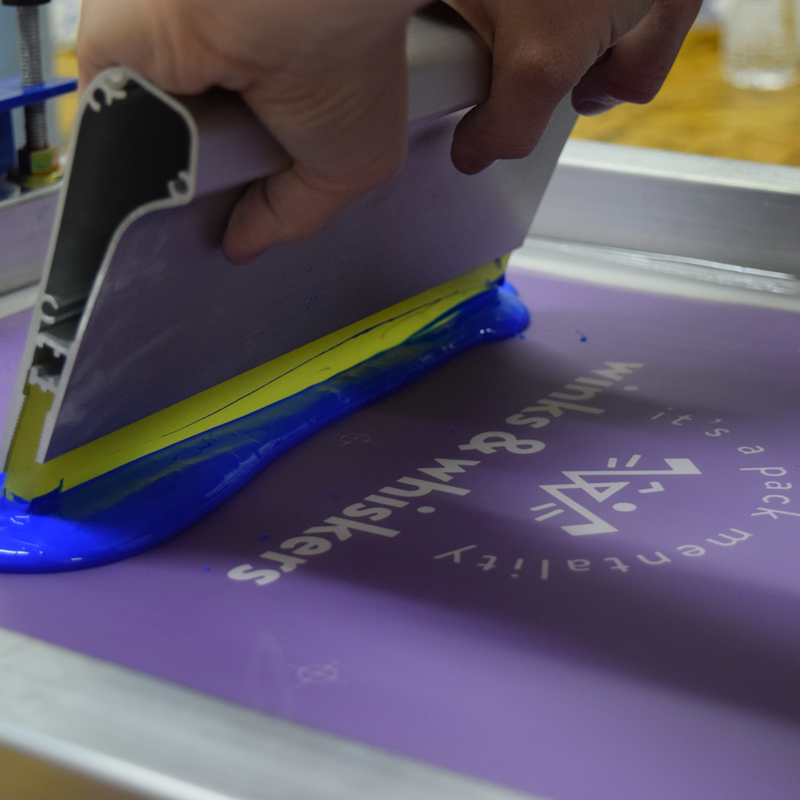 W&W: Another quality that sets us apart from other apparel companies is that we create our own designs. After talking through an idea for phrasing and paired graphic, we research to make sure the design we have in mind is ORIGINAL and not similar to any others out there. We pride ourselves on being authentic in this way. It’s easy to see a design you like, change a few things and call it “your own”. That is simply NOT what we are about. Eric starts with sketching – putting pencil to paper every time. Ink comes next to bring life to the design, then scanning and digitizing. I go through potential shirts and colors to find the right style with COMFORT in mind, always! Tell us a little more about your clothing line! Do you release new designs every season? Are sweatshirts on the horizon? W&W: Our apparel will always be comfy and soft! 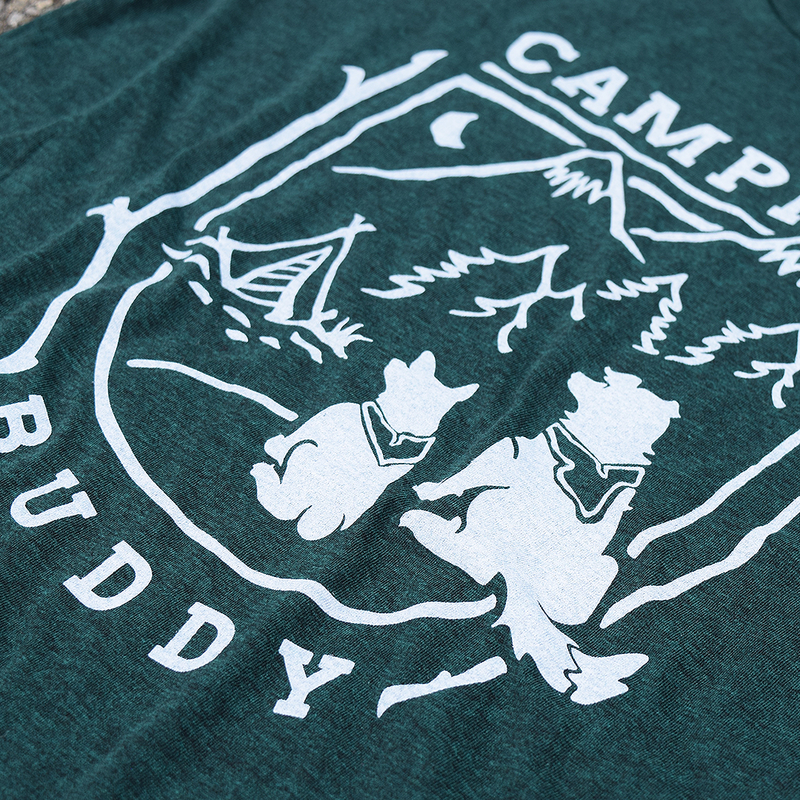 We love using tri-blend shirts to get the best quality and feel available. We are coming out with new designs for the fall and we will have a sweatshirt as well this year! We try to come out with new designs each season that pet parents will enjoy. 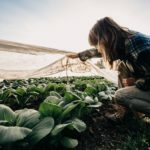 Do you have one piece of advice for someone looking to start a passion business that gives back to charity? W&W: When things get tough, remind yourself that your building a business from the passion you have for this one thing and that you have made a positive impact (no matter how small it might feel) by giving a portion of your time and/or money. What’s your favorite Sadie road trip story? 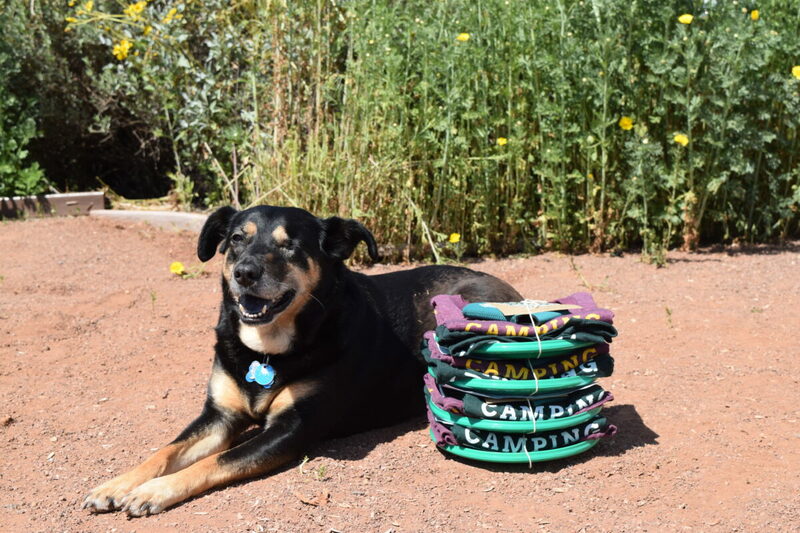 W&W: Sadie is an amazing road trip companion! Asheville, North Carolina sticks out as our favorite road trip with Sadie because the whole town was extremely pet friendly! This particular trip was before we started full-timing. We got a wonderful, pet friendly Airbnb, took her on the trolley tour of the city and there were dog bowls at every other store downtown. Then we went to Blue Ridge Parkway (just 15 minutes from the city) and all the hikes are dog friendly. 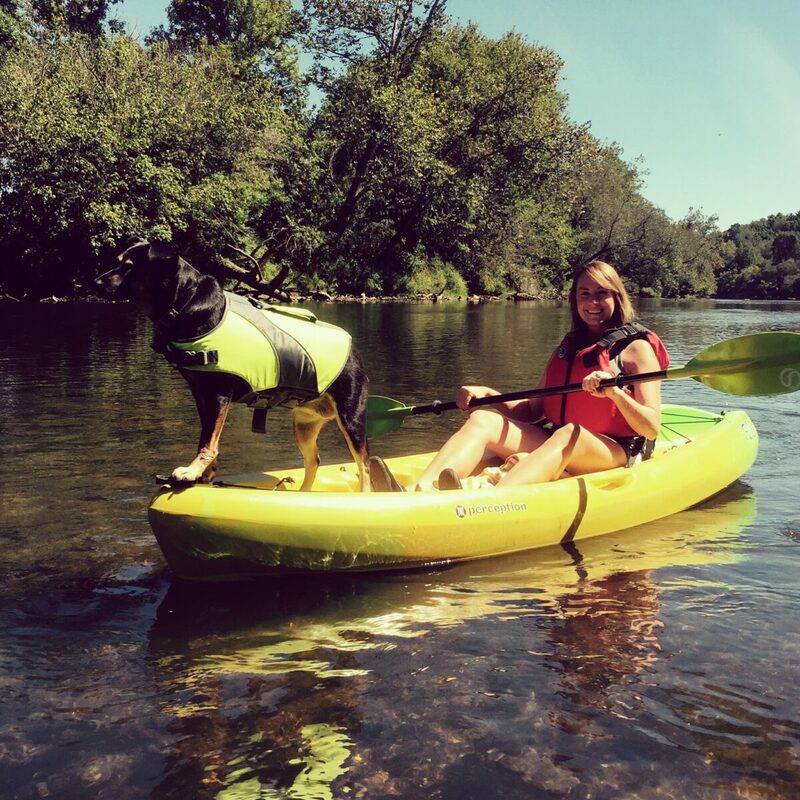 To top off the trip, we kayaked down the French Broad River with Sadie in tow. Are you looking for ways to get involved in your community? Come join us tomorrow at our West Sacramento store for our first Community Dog Walk Event! There will be a puppy photo booth, DIY station, local shelters that you can adopt from on site and so much more! Hey Buddy!, I found this information for you: "La Mesa RV Gives Back Part II: Interview with Winks & Whiskers". Here is the website link: https://experiencelife.lamesarv.com/2018/09/la-mesa-rv-gives-back-part-ii-interview-with-winks-whiskers/. Thank you.